Our best marks so far Watch some of the most exciting passages of play from the first 12 games of Collingwood's 2017 home and away season. Jeremy Howe has played all 14 games for Collingwood in the 2017 home and away season. Picture: AFL Photos. 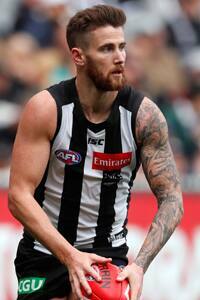 Collingwood’s leadership group has grown an extra member in the form of high-flying defender Jeremy Howe. Originally a three-man team consisting of Scott Pendlebury, Steele Sidebottom and Taylor Adams earlier in the year, Howe has this week received the unusual honour of a mid-season elevation. It comes as recognition for a well-liked member of the Magpies’ playing group who has found career-best form playing in defence in 2017. “I think my leadership is something that I have worked on and has grown over the years,” Howe told Collingwood Media on Thursday. While consistency has been found in defence this season, the year itself has been an impressive outlier in a career spanning two clubs and multiple roles. Howe has been reliable in defence, and is averaging career-highs in disposals (average of 21.8 per game), marks (8.8), rebound 50s (4.4) and contested marks (2.4). The Tasmanian says his new-found role won’t change his on-field actions, or the relationships he currently has with the men he shares the field with. “I’ll try and lead by example, play the best footy I can and help others out when I can as well,” he said. These are the three traits Howe hopes he has taken from a leader he admires above any others. Nathan Buckley, Scott Pendlebury and Melbourne’s Nathan Jones have directly and indirectly shared plenty on how to successfully lead at a football club. Yet it’s his father who has inspired Howe since day one. “A leading figure in my life is my Dad. He’s a very honest guy who works extremely hard,” the 27-year-old said. “I think in terms of getting the best out of yourself, it’s something that he’s always strived to do. Upon learning of his elevation late last week, Howe was quick to check in with his old man. “He’s as excited as I am. Nathan Buckley and Jeremy Howe after Collingwood's ANZAC Day loss to Essendon. Picture: AFL Photos. Why wait to acknowledge excellence? Nathan Buckley approached Howe last week to pose the question of whether he wanted his leadership formally acknowledged. The idea had already been discussed with the current leadership group, with Howe’s actions on-field and around the club noted by all involved. “He’s just elevated his impact on the group with that consistency, not just in performance, but in driving the program, driving standards and driving training,” Buckley told Collingwood Media. “Now the challenge is for him to continue to develop and see where he can take it.